In April this year I had the honor to present for the CliniClowns international in Belgium. Those present were all responsible for marketing and social media for their specific European countries. What I took away from that experience, is that every country was in a different stage of development when it came to market interaction. What they all had in common is that they all worked in the traditional media way: local newspapers and press got a lot of attention, whereas the interaction with those interested, the common people, via social media was not given a lot of attention. When preparing my presentation for that day, I went really deep into the latest developments for charities and read many articles by specialists. I also contacted my former colleague Dana Oshiro, who always had a passion for helping out charities with communication campaigns. Dana worked with me on the launch of Respectance.com in San Francisco in 2007. She put me on the right track and indicated which people inspired her. I also watched her speech on TedX, I recommend you to watch as well if you’re interested in this matter. After this study I had to make a model that would make it easier to transfer the learnings I gathered. This model I named the 4C model. It’s an abstraction of the four most important issues to tackle to become a successful charity. It’s a perfect model to use when creating a social media strategy, because it puts the receiver, your sponsor, at the heart of your communication. It should prevent you from becoming the next broadcaster of its own achievements and needs. The core of a charity brand should be the understanding that people have an urge to do something good, or to contribute to something they believe in or want to support. This means that you have to understand what drives the (potential) sponsor of your charity. In case of CliniClowns this translates as follows. Does he love to watch clowns, or does he believe that children with an illness should have some relief? If you understand this, you have done half your job already. Accept that every human being has the universal need to do good. Even evil people, have a weak spot somewhere. The second layer is the cause. What cause are people giving money for? They most likely do not give money because of the brand you are at first instance. They first and foremost donate because of a cause they believe in, they want to help out, or they want to solve. For instance the Aids foundation gets money because people want to find a cure against aids. The third layer contains co-operations. As a charity you have to show that you are not in business for your own glory, but because you want to help the cause in co-operation with all the stakeholders that are involved in the same cause. So the Aids foundation does good to show they co-operate with researchers, hospitals, LGBT organizations and what not more. Share the stage with all the important parties, or even give them a stage to show their knowledge. This will make it clear to (potential) sponsors that you’re really in it for the cause, not to pay the CEO of your charity. 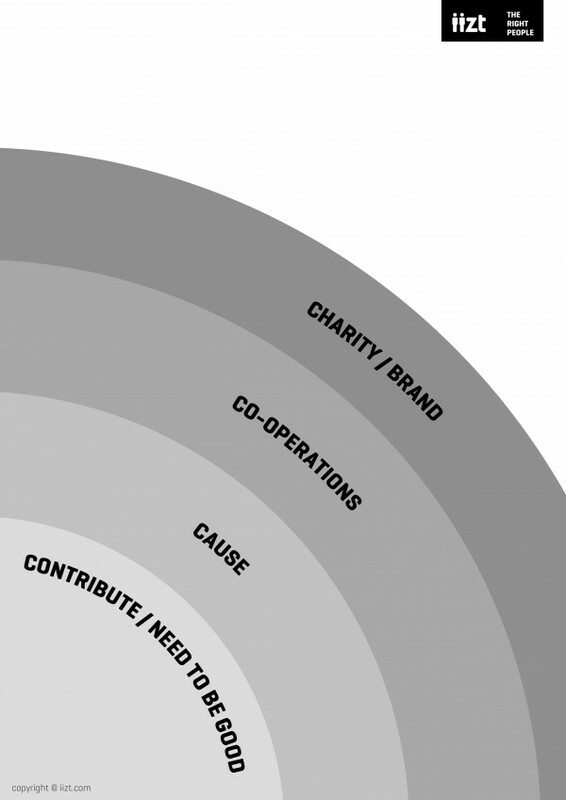 Last and final circle in this model is your charity, or brand. Lots of charities see this as their core. Unfortunately in the eyes of your sponsors it’s just a name or taste. The best thing you can do for your brand, is get your core and circles right. Then on top of that you should have the balls to be open and transparent. This means, you show exactly how much donations you receive, what you do with it, what the results are, what your overhead is. This will be a humbling experience, that might find a lot of internal resistance. However, it is the only way to growth and stay/become a strong brand. If you cannot do this, you will meet trouble sooner or later. As our times are changing rapidly. If you’re interested in this matter, let us know. We’d love to share our findings in presentations. And we we would be happy to help you find ways to improve your (social) marketing strategy. Read more here about visual strategy for CliniClowns.